Students traveling to the conference are expected to arrange for funding from their home Departments. If your home department is unable to fund you, please write to us at cuwip@umass.edu with the subject line “CUWiP: Travel” to request funding. Keep in mind that in order to be reimbursed for travel, all funding requests must be approved prior to your making any travel arrangements. You may also contact us if you would like guidance in asking your department for travel funds. Weather Update: The conference will end AFTER the Keynote address on Saturday Jan 19 at 3:30 pm! We will have grab and go dinner at 3:30 pm. Check the home page for the updated schedule. Contact us with any questions at cuwip@umass.edu. By car: Locations of the hotels are listed below. Directions to UMass from most origins can be found at http://umass.edu/umhome/visit_campus.html. This website will also direct you to appropriate maps for western Massachusetts as well as campus maps. Parking information is provided at the end of the page. By train: Union Station, Northampton is the closest train station. It is about 20 minutes from UMass by Uber/Lyft or you could take the bus (PVTA – B43). Greyhound: 800-229-9424, serves Springfield, Mass. Pioneer Valley Transit Authority (PVTA): 413-586-5806 local service is free for students during the school year. Peter Pan Bus Lines: 800-343-999, services Amherst, Mass. The main conference site is the Integrative Learning Center at UMass, please see the map above, or you can check the online campus map for further location details. The registration desk will be at the southwest entrance: if you enter from the entrance on North Pleasant Street, make your way to the opposite entrance. We will have a place for you to store luggage until you go to the hotel. If you are arriving by Peter Pan bus, plan to get off the bus at Haigis Mall. 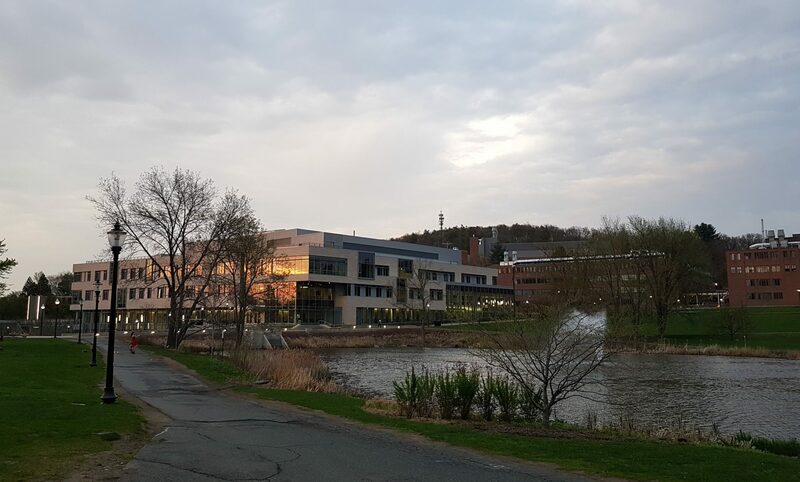 The ILC is a short walk from there, see the campus map above. If you are driving and have been assigned the on-campus hotel, please park at the Campus Center garage marked on the map. If you are driving and plan to arrive before 5 pm on Friday, we will inform you where to park. If you are driving and plan to arrive just in time for the 5 pm session, you may park at visitor lots 65 (preferred), or 62/63 indicated on the campus map. If you are coming by Lyft/Uber from the railway station or elsewhere, please come to ILC directly. On-campus parking is unrestricted on Sat and Sun, and you can again park in lots 65, 62 or 63 indicated on the campus map above. We will provide shuttles to the hotels Friday night, to and from the hotels on Sat, and to the conference on Sun as below. There will be no shuttle from the hotels on Friday afternoon, so please plan to come directly to UMass. 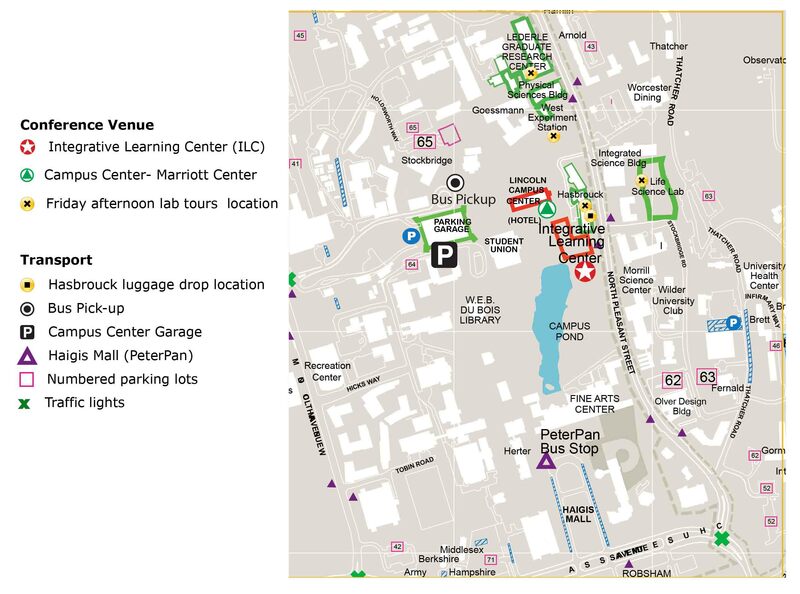 Conference shuttles will drop off and pick up on the Campus Center circle by the parking garage. Each bus will travel to and from one of two designated hotels, so make sure you are on the right bus! Important: Make sure you check out Sunday morning before leaving the hotel, and bring your luggage to the conference. The cost of lodging and food will be covered by the conference. Non-local students will be assigned to a double room (two attendees per room, unless requested otherwise) in one of the hotels listed below (shown as red pins on the map above). Hotel reservations will be made by the organizing committee on behalf of the students, so there is no need to book your own room. All hotel costs for registered students are covered by the conference. We expect students from the local area to make their own arrangements; if you have any queries please contact us at cuwip@umass.edu with the subject line “CUWiP: student housing”. UMass students living on campus may move in early on Friday, January 18th. The fees for the early move-in will be covered by the conference. Shuttle service will be provided between the hotels and campus. Roommate requests: If you have a roommate request, please be as specific as possible about your needs during the online application. We will do our best to accommodate requests, but cannot guarantee that you will be paired with your requested roommate. If you do not have a preference or the other person does not also indicate their preference, we will randomly assign you a roommate. Park at a metered parking space. (Certain lots have parking meter pay stations.) Cost is $1.50/hour. Meters are enforced from 7 a.m. to 7 p.m.
Park at the Campus Center Parking Garage: $1.75/hr. On the weekend, free parking is available in a number of campus parking lots. Use the interactive campus map to identify parking spots and the campus garage. More information is also available on the Parking Website.